Though neurally adjusted ventilatory assist (NAVA) is known to improve patient-ventilator interactions in infants with bronchiolitis [1, 2], its impact on respiratory muscles unloading has not previously been studied. We conducted a secondary analysis (ethics committee approval CE_SRLF_18-48) of a prospective physiological study  which evaluated the impact of body positioning on work of breathing (WOB) in infants with severe bronchiolitis. Seven of the children included (median age 35 [27–63] days) had a respiratory recording during the transition from nasal continuous positive airway pressure (nCPAP; set at 7cmH2O ) to NAVA. Esophageal (Peso), gastric (Pga), and airway (Paw) pressures, as well as Electrical activity of the diaphragm (Edi), and flow were recorded simultaneously. Median NAVA level was set at 0.7 [0.7–0.9] cmH2O/μV and median positive end expiratory pressure at 5 [4–7] cmH2O. 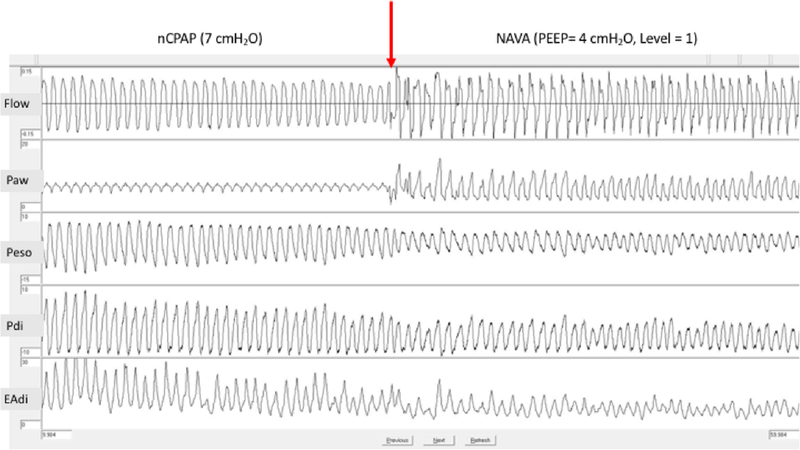 Twenty-five breaths during the last 2 min in nCPAP then during the first 2 min in NAVA were analyzed off-line. Metabolic cost of breathing was estimated by the Peso (PTPeso) and diaphragmatic (PTPdi) pressure time product, inspiratory effort by the Peso (ΔPeso) and diaphragmatic (ΔPdi) pressure swings, and respiratory drive by the Edi swing (ΔEdi). Data were expressed as median [IQR] and compared using Wilcoxon two-sample paired sign test. A p value < 0.05 was considered significant. As detailed in Table 1 and illustrated in Fig. 1, all indices of WOB (PTPeso, PTPdi, ΔPeso, ΔPdi, Edi swing, and inspiratory time to total time ratio (Ti/Ttot)) decreased significantly in every child with NAVA as compared to nCPAP (p < 0.05 in all instances), while the mean Paw was increased (p < 0.05). In this physiological study, we report an improvement of respiratory unloading by adding a second level of pressure with NAVA in infants with severe bronchiolitis. WOB decreased immediately after switching to NAVA (Fig. 1), as reported previously in adults with obstructive lung diseases , and was associated with a lower neural drive and Ti/Ttot ratio. This study has several limitations, including the small sample size, the short study period, the non-randomized order of recordings, and the non-standardized NAVA settings. However, the consistent, rapid, and large improvement in WOB-related indices observed in every infant is an important finding, especially considering the number of infants with severe bronchiolitis who may benefit from an improvement in non-invasive support. The findings support the need for further evaluation of the potential interest of NAVA to improve the efficiency of non-invasive support in infants with bronchiolitis. We thank Philip Robinson (DRCI, Hospices Civils de Lyon) for critical revision of the manuscript. The study was supported by a grant from the Fondation du Souffle et le Fonds de Dotation “Recherche en Santé Respiratoire”, by a grant from the Association Lyonnaise de Logistique Post Hospitalière (ALLP), and by a grant from the the Groupe Francophone d’Urgence et de Réanimation Pédiatrique (GFRUP). The datasets generated and/or analyzed during the current study are not publicly available according to the French National Data Protection Commission (CNIL) but are available from the corresponding author on reasonable request. FB and EJ conceived the study, analyzed and interpreted the data, and drafted the manuscript. GE, SE, JB, and CG analyzed and interpreted the data and revised the manuscript. JB and SE provided the technical support. All authors read and approved the final manuscript. The primary study was approved by the institutional review board (CPP SUD-EST3—n°2015-057B) and by the national medicines authority (ANSM–151048B-32) and written consent was obtained from the parent(s) or guardian(s). The secondary analysis was approved by the ethical committee of the French intensive care society (CE_SRLF_18-48). FB has received speaking fees and non-financial support from Maquet Critical Care. GE’S research program is supported by a research grant from the Fonds de recherche en santé du Québec. 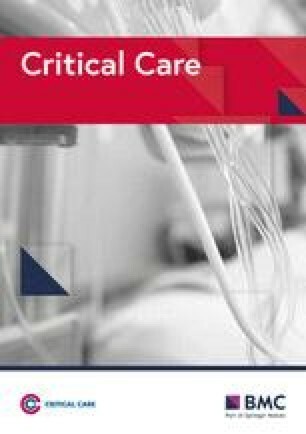 He also recently conducted a feasibility study of a new ventilator, which costs were supported by Maquet Critical Care. The others authors declare that they have no conflict of interests.